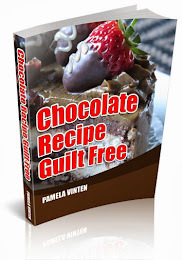 Free Tasty Chocolate recipes for Chocolate Lovers! 2 cups coarsely chopped toasted almonds (toasting intensifies the almond flavor - be sure nuts are completely cooled before stirring into the dough, or they'll melt the chips)! Preheat the oven to 325 degrees F. Set out two large nonstick cookie sheets. (Do NOT grease). Yield: 2 to 3 dozen large "bakery-shoppe" type cookies. Sift flour once, measure, add baking powder, soda and salt and sift together three times. Cream butter thoroughly, add sugar gradually, and cream together until light and fluffy. Add eggs, one at a time, beating thoroughly after each. Add melted chocolate and blend. Add flour alternately with milk, a small amount at a time, beating after each addition until smooth. Add vanilla. Bake in two greased 9-inch layer pans in moderate oven, 350 deg. F., 30 minutes. Chop toasted nuts in a blender or food processor until finely chopped. Slowly drizzle in 3 tablespoons of melted butter and process till well mixed. Set aside. Heat remaining 4 T of butter in a small saucepan until very hot and bubbly (be careful not to let it burn). Remove from heat and add the chocolate. Stir constantly until smooth and melted. Set aside. Place your choice of coating in a bowl. If you're going to have more than one, use separate bowls. Some possibel coating choices are: toasted coconut, chopped nuts, unsweetened cocoa, powdered chocolate, crushed Oreo® Cookies. Scoop out a teaspoon full of the truffle mixture and, using your fingers, roll it into a ball. Work quickly as the heat of your hand will quickly start melting the chocolate. Drop ball in the coating bowl. Repeat the process until there are 4 or 5 balls in the coating bowl. Gently roll the truffles in the coating mixture and a sheet of waxed paper. Wrap truffles in an air tight container and store in the refrigerator for up to ten days or in the freezer for up to a month. Food Safety Note: Pregnant or nursing women, young children or any with an immune deficiency should not eat foods made with raw eggs. Heat butter in a small saucepan until very hot and bubbly (be careful not to let it burn). Remove from heat and add the chocolate. Stir constantly until smooth and melted. Set aside. In a large bowl, beat egg yolks until foamy. Beat in the sugar gradually, add extract and liquer and continue to beat until thick (see photo). With mixer on slow to medium speed, gradually beat in the melted chocolate mixture. Beat until smooth and well mixed. Cover with plastic wrap and refrigerate for at least thirty minutes or until firm. Food Safety Note: Pregant or nursing women, young chilren or any with an immune deficieny should not eat foods made with raw eggs. Line a 13 X 9 pan with foil. Grease or spray with Pam. Combine marshmallows, butter, and chocolate in a microwavable bowl. Mike for 4-6 min. checking and stirring every 2 min. until melted. Stir in Rice Crispies and coconut. Spread in pan quickly using a buttered spatula. Chill. Cut into small bars, finger size.